I love having people stay at our house during the holidays. I feel like it adds to the overall hum of excitement and gives me an excuse to cook recipes I wouldn’t normally cook for a small family. I love french toast but it’s not always the most feasible thing to make for a crowd. 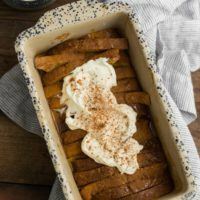 However, this baked pumpkin french toast takes my favorite flavors/textures and turns it into an easy meal that can feed a crowd! Cut bread into quarters, diagonally. Arrange crust side up in a loaf pan. 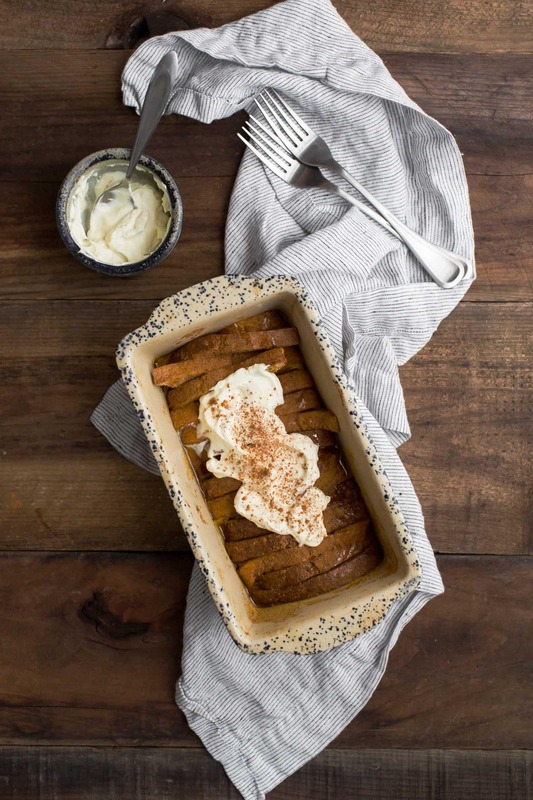 In a medium bowl, whisk together pumpkin puree, milk, eggs, vanilla, cinnamon, nutmeg, cloves, ginger and salt. Pour the egg mixture over the bread and lightly press down so that most of the bread is moist. Let sit while the oven heats. Bake for 20 to 25 minutes, until eggs have set and the french toast is puffed. Serve with a drizzle of maple syrup and whipped cream if desired. 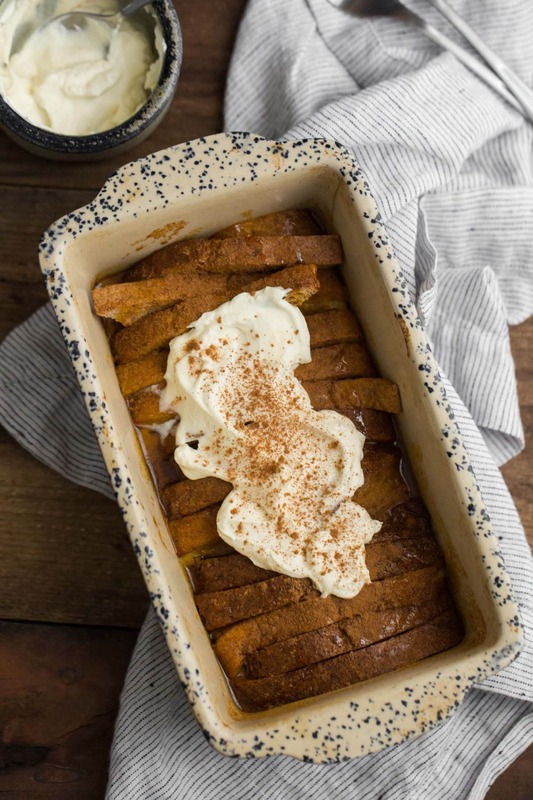 Tips & Tricks: Ends of bread loafs are an excellent choice for this baked french toast. Arranging crust side up gives a bit of extra crunch to this dish. BREAD: Swap out sandwich bread for leftover rolls, or day old baguettes or ciabatta. For more stale bread, cut into 1 inch cubes (about 2 cups total) and place in loaf pan as above. SPICES: Swap out the traditional pumpkin pie spices for a savory blend and serve for a strata-like dinner. Try it with thyme, sage, salt and pepper! BUTTERNUT SQUASH: Don’t have pumpkin? Mashed butternut squash would make an excellent substitute for the pumpkin puree in this recipe. 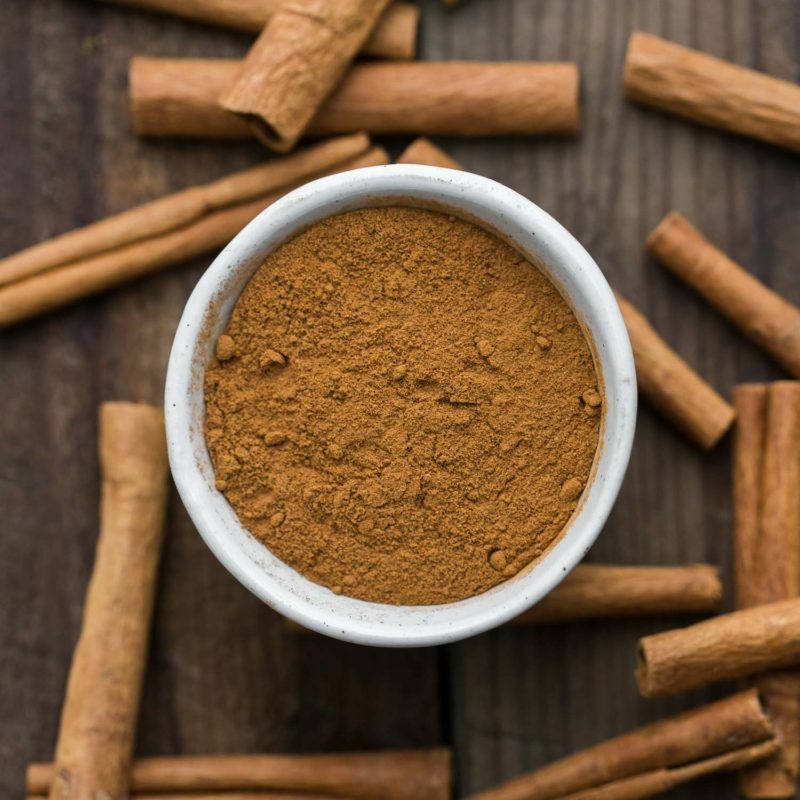 It’s easy to forget about the spice cupboard and take for granted that you always have cinnamon on hand. However, spices lose their flavor overtime so think of this as your gentle reminder to buy in small quantities (bulk spices at the co-op are great) and replace your spices on a yearly basis! Do you just dump the egg mixture in the pan? Any soaking? Fabulicious!!!! This is one breakfast that I’m completely ok with! Do you think you could use aquafaba for the eggs? I’m not really sure- I’ve never worked with aquafaba. Yum! This was really easy to make and turned out very nicely. It’s a great recipe for leftovers, and you gotta love a dish that’s so adaptable based on what you have on hand. I used a spatula (aka my fingers) to make sure that that the mixture coated the inside of each slice of bread. Our batch was custard-y on the bottom and crunchy on the top . Great recipe for a crowd or to brighten a regular ol’ gloomy Portland Sunday. Thanks, Erin! This is perfect for a fall brunch! Love all the spices in it. Can’t wait to try it out this weekend! Could I sub almond milk for whole milk?